Today on homify we want to share with you a wonderful family home that is capable of producing its own energy. This kind of energy efficiency doesn’t have to be clunky or industrial in its style. This prefab home is modern and elegant. It’s a great family home on two floors with plenty of living space. The open plan on the main floor is visually divided up, creating a beautiful heart of the home. Some unexpected touches make it perfectly livable. This home ticks all the boxes for a family home and is an all around smart and modern living concept. Come join us on our tour of this incredible home! 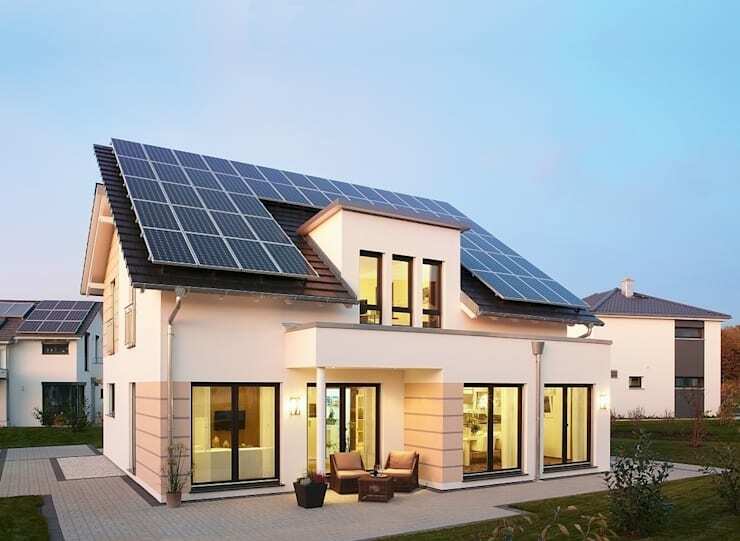 Solar cells blanket the roof of the home. And why not? This kind of unused space is better put to reducing the carbon footprint of your household. Combined with an innovative wind turbine, the home has a positive energy balance. The roof of the home is intricate. There are opposing staggered pitched roofs on either side of the home. Asymmetrically arranged flat roof extensions jut out and create bold angles. The main floor has many floor to ceiling windows and opens out to a pleasant deck space. Let’s go take a look inside. The living room of the home is awash with dazzling white. A taupe accent wall provides depth for the room and a touch of elegance. Unique cabinets provide storage and a modest opportunity to display items behind dark glass. We love the wood floor. It grounds the room and anchors the chic minimalist style. The living room is layered with shades of white. Gauzy curtains and a two-tone painting give the room an expansive and airy feel. What room isn’t complete without a high-pile rug like this! Connect with interior designers and decorators on homify today to start creating your own inspired design. This bathroom could have been pulled straight from a high end hotel. Check out the huge windows that flush the room with light. Perfect for getting ready in the morning. Dark and closet-like bathrooms are miserable. Why not design a bathroom that you love to use? 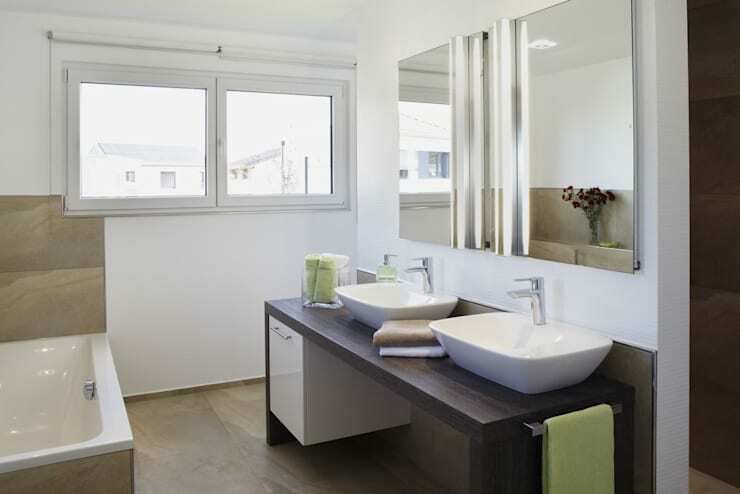 The double sink is paired with a well-lit vanity mirror. Fresh green accents accompany the dark natural wood of the counter unit. There is a single cabinet tucked beneath the sink. A little bit of storage is all you need in a bathroom to keep the clutter away! 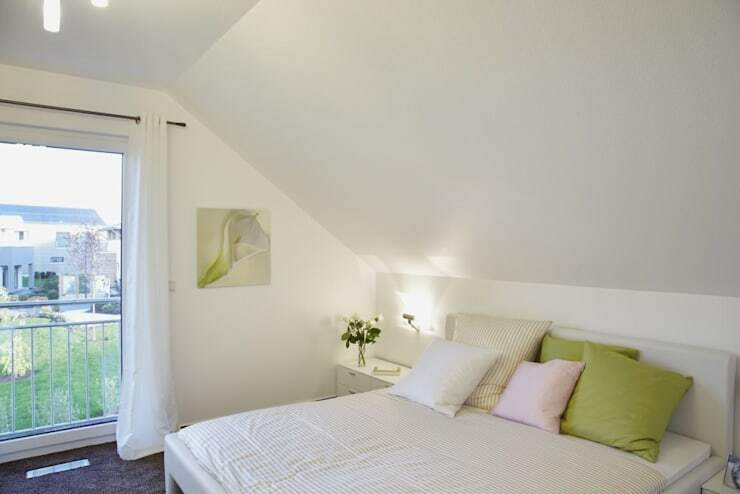 One of the three bedrooms in the home, this one comes with a deeply angled roof. The shape of the room is cozy and conducive to getting a good night’s sleep. Cool air from the open balcony can freshen up the room easily. There is a clean approach to decorating this bedroom. The furniture matches and blends in with the walls. The dark carpet makes the white tones of the room seem more sophisticated. There is an open and fresh charm to the bedrooms that we love. 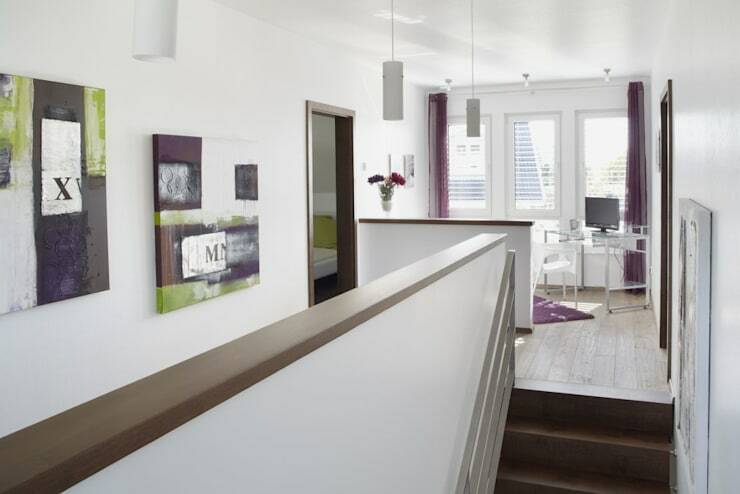 A spacious upstairs hall is a surprising addition to this home. 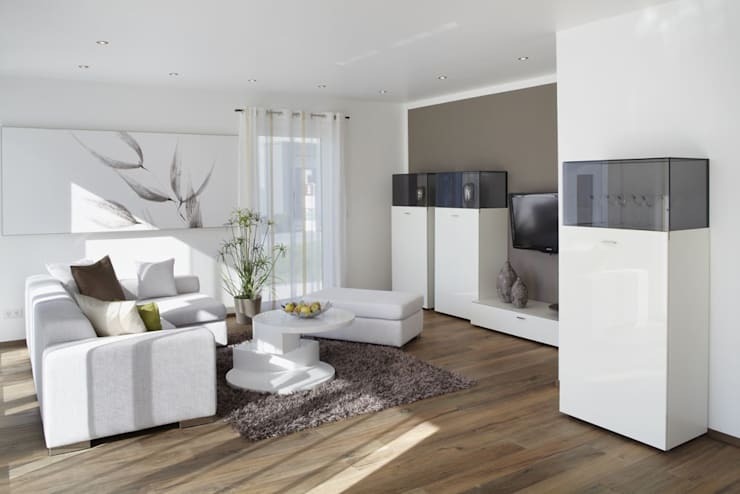 Modern and minimalist homes tend to forgo hallway and corridor space in favour of open plans. This home embraces the old style and uses it to create a petite office on the stairs landing. Having an office on a landing like this can also free up space elsewhere in the home. Large landings like this tend to be forgotten spaces. This is great for parents who want to keep an eye on their kids as they gallop from room to room during play time. With no TV or fridge nearby, distractions are limited. It makes a great opportunity plow through work. We love the lush purple accents in this space. Using accent colours like this helps divide up the space in your home. This galley style kitchen is spacious. A change in the flooring helps section off the kitchen from the dining area. An open plan is still maintained with clear sightlines making the home appear larger. The luxe countertops and minimal backsplash are great additions. 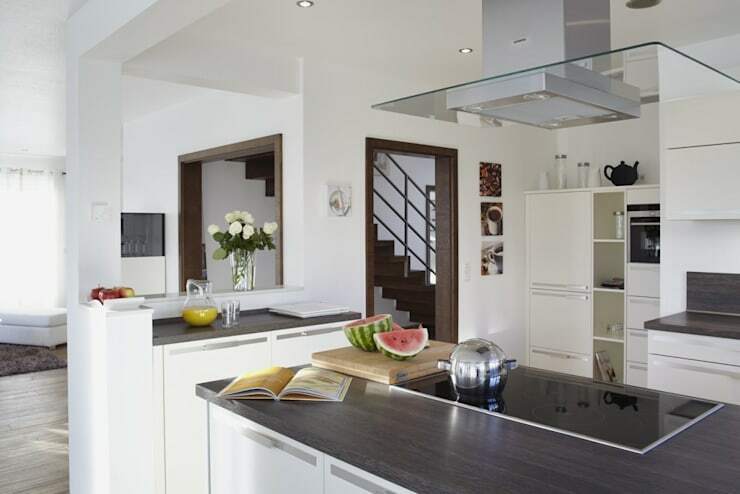 We love the arrangement of the kitchen. There is an abundance of counter space that’s perfect for entertaining. The narrow entrances to the kitchen mean that guests and kids can’t get in your way. While you prepare food the open plan design helps keep you in the conversation. From a different view we can see some of the best features of the home. The staircase is a modern fixture that ups the style of the home. 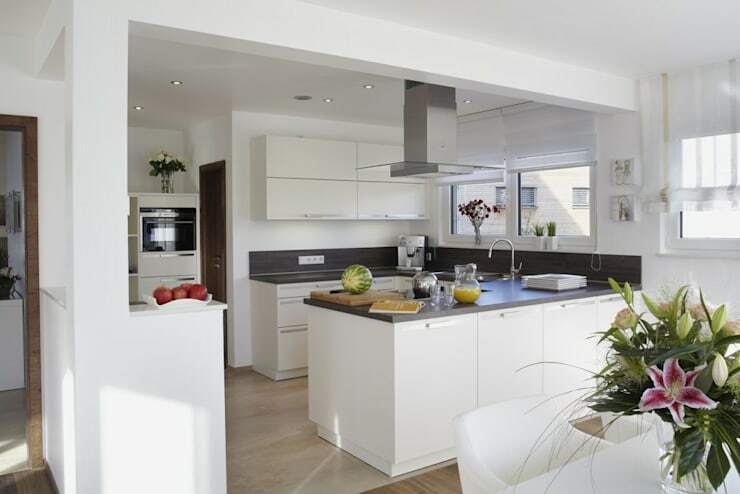 The almost open plan of the living, kitchen, and dining areas forms a social hub in the home. The kitchen has an induction stove top for ease of cleaning and plenty of storage. The home’s ability to produce its own energy is almost forgotten after we take a look at the chic style of the home. We love to see homes that are environmentally friendly and easy on the eyes. Our last stop on our tour is where we check out the facade of the home. It looks completely different from this angle! We love the asymmetry of the house. You could never guess that a look like this could be achieved by a pre-fab home. The touches of beige on the home warm up the modern exterior nicely. Thanks for taking a look at this home with us! 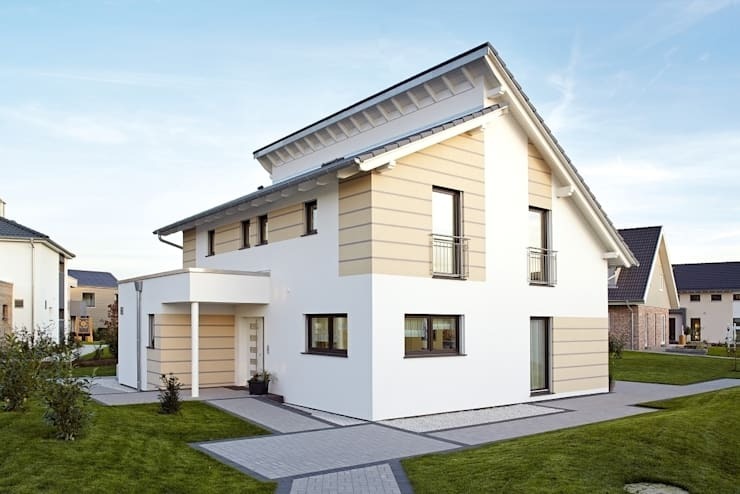 Isn’t it great to see a home where style and energy efficiency come together in one cohesive whole? For more home inspiration that's easy on the eyes and the environment, check out our feature on an eco-chic home. What was your favourite feature of the home?